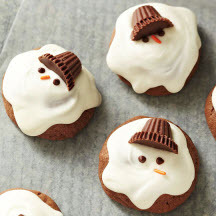 How cute are these chocolaty melting snowmen cookies? These Christmas cookies are easy to make—no rolling pin needed! In a large mixing bowl beat shortening and peanut butter with an electric mixer on medium to high speed for 30 seconds. Beat in the granulated sugar, brown sugar, baking powder, salt, and baking soda until combined, scraping sides of bowl occasionally. Beat in egg, milk, and vanilla until combined. Beat in the cocoa powder and as much of the flour as you can with the mixer. Stir in any remaining flour. Line a baking sheet with waxed paper. Place cooled cookies on prepared baking sheet. In a medium microwave-safe bowl microwave candy coating on 50% power for 2 1/2 to 3 minutes or until melted and smooth, stirring every 30 seconds. Spoon melted coating over each cookie to cover cookie and resemble melted snow. While coating is still tacky, add a peanut butter cup for a top hat and decorate with sprinkles or other candies to resemble snowman faces (If using frosting to make snowman faces, add it when the candy coating is dry.) Let stand until set. Note: Dough may be shaped into balls and then frozen until solid on parchment- or foil-lined cookie sheets. When frozen, transfer balls to an airtight container; cover. Store in the freezer. When ready to bake, arrange frozen balls on cookie sheets and bake as directed for 12 to 14 minutes. To Store: Place cookies in a single layer in an airtight container; cover. Store at room temperature for up to 3 days or freeze for up to 3 months. Nutritional Information Per Serving (1/20 of recipe): 315 kcal cal., 17g fat (9g sat. fat, 2g polyunsaturated fat, 1g monounsatured fat), 10mg chol., 101mg sodium, 38g carb., 1g fiber, 28g sugar, 3g protein.